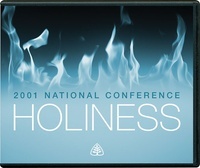 In this series of lectures from Ligonier Ministries’ 2001 National Conference, “Holiness,” Alistair Begg, Jerry Bridges, Sinclair Ferguson, Susan Hunt, Rosemary Jensen, John MacArthur, R. Albert Mohler Jr., and R.C. Sproul provide a comprehensive overview of the holiness of God. The speakers discuss holiness as an attribute of God’s character, holiness as an attribute of revelation, and explain how holiness is to inform our worship, our piety, and our family life.